***** As a fan of both mus icals and stories of cons, I was delighted to be in the audience for the opening night of the South Yorkshire premier of a show that combines the two, Southey Musical Theatre’s production of Dirty Rotten Scoundrels, at the Montgomery Theatre, Sheffield until Saturday 13 May. Based on the classic film comedy starring Michael Caine and Steve Martin, the musical promises a hilarious, all-singing, all-dancing romp of high-jinx and sophistication. Set on the French Rivera, the musical tells the story of what happens when the decadent world of suave conman Lawrence Jameson comes crashing down after the arrival of larger than life Freddy Benson, a conman of an entirely different order. The two find themselves going head to head in the con of their lives, pulling out all the stops in a bid for the affections of a millionaire soap heiress Christine Colgate. The show combined crisp direction (thanks to director Mark Feakins) and choreography (thanks to choreographers Mark Harris and Carla Jane Wade) with perfect accents, stylish wardrobes, incredible singing voices, great stage props and brilliant comic timing throughout, even when things intentionally went wrong, with great performances from everyone from the main characters to the smallest ensemble parts. The laugh out loud cheesy and physical humour (including the classic pretending to walk down stairs), misunderstandings and innuendos that packed the brilliant script were made even funnier with high class accents. It is also the only musical I have seen that mentions my favourite chocolate “Toblerone”. The breast adjustment by one of the glamourous maids opening the curtain on the show and the stylish black and gold theme of the opening scene gave the audience a great idea of the style of classy comedy they were in for, especially when it was all upstaged two minutes later by two nuns, a moving plant and a stagehand appearing from back stage to rescue the situation. The moments of speaking directly to the audience and the opening song “Give Them What They Want” outlining the rules of a good con, reminded me of one of my favourite ever television dramas “Hustle” and continued to provide an excellent introduction to the con artist scene where charming men can be forgiven for anything. In “What Was a Woman To Do”, Joanie Ringrose as Muriel showed off a stunning jazz voice (in a song that showed even the theatre usherette had been a victim of a con man), and later showed that she could pull off a classic Del Boy move when she falled through the bar. Martin Scattergood as Lawrence showed that he was such a good con man that he even had power over the lighting, exuding taste, charm and the classic good looks his character required and whose relationship with Freddy, played by Ben Bason, was almost a “My Fair Lady” bromance. “Great Big Stuff” was a great introduction to new con man on the scene Freddy, sung and danced with American crassness and on the verge of breaking into Will Smith, Fresh Prince style rap, made even funnier when he continued to sing with his mouth stuffed with marshmallows. Lawrence’s companion Andre (Mark Holmes) was played brilliantly with European cynicism that would make you pleased to have him by your side but more nervous if he arrested you in his role as chief of police. Rosie Coppin in her role as Jolene brought out her inner Dolly Parton in her looks and speaking voice and in her singing voice in “Oklahoma” her inner Doris Day, followed by a lesson in line dancing and a conga accompanied by the ensemble. The versatility of Ben’s acting skills continued to show when he pretended to be Lawrence’s younger brother Ruprecht who became more and more weird and unnerving in the song “All About Ruprecht” that started off as a sweet lesson in DNA. Gina Townend as Christine from her first appearance in “Here I Am” had bubbly confidence and sweetness oozing out of her and giving “Legally Blonde’s” Elle a run for her money with inner klutz, innocent, naivety and accident prone-ness, before in “Nothing is to Wonderful to be True” displaying a Disney princess worthy singing voice. Like any good two part story, Act 2 started with a repeat of the Act 1 cliffhanger. Don’t want to give this away and the rest of the story, but proving that you should never place a bet with a fellow con artist, everything is never quite what it seems and love always comes when you least expect it. In “Ruffhousin’ Mit Shuffhasuen” and the tango style “The More We Dance” Martin mastered a singing voice that is a cross between the Muppets’ Swedish Chef, the recent television “Hannibal” and yodeling. If I was a Shirley Valentine style singleton I would have easily fallen for Mark’s charming seduction technique lesson in his duet with Joanie “Like Zis, Like Zat” that turned into a romantic Fred and Ginger style dance routine. “Love is in my Legs” was a brilliantly bad boy band style song just in time for this weekend’s Eurovision competition in contrast with “Love Sneaks In” that showed Martin had a Michael Ball West End worthy voice when it comes to big love songs. Ben in “Son of a Great Big Thing” was almost straight out of the “Witches of Eastwick” musical, and almost brought the devil out of him. The final number “Dirty Rotten Number” and its lyrics was the perfect swing ending to a brilliantly hilarious and exceptionally presented musical, providing an outstanding duet between Martin and Ben, with Ben’s singing voice being at its strongest all evening and the bromance chemistry and respect between them being obvious. With a history going back to 1933, Southey Musical Theatre Company is a Sheffield based amateur theatre company producing everything from full scale shows to intimate concerts. For further information visit www.southeymusicaltheatrecompany.co.uk. 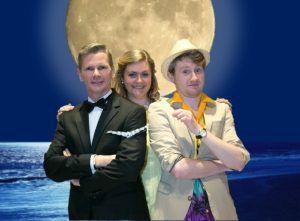 Dirty Rotten Scoundrels is on until Saturday 13 May at 7.15pm, with an additional 2.15pm matinee on Saturday, at the Montgomery Theatre. Tickets are £15 for the evening performances and £14 for the matinee. To book telephone 0114 327 2983 or email smtctickets@gmail.com.